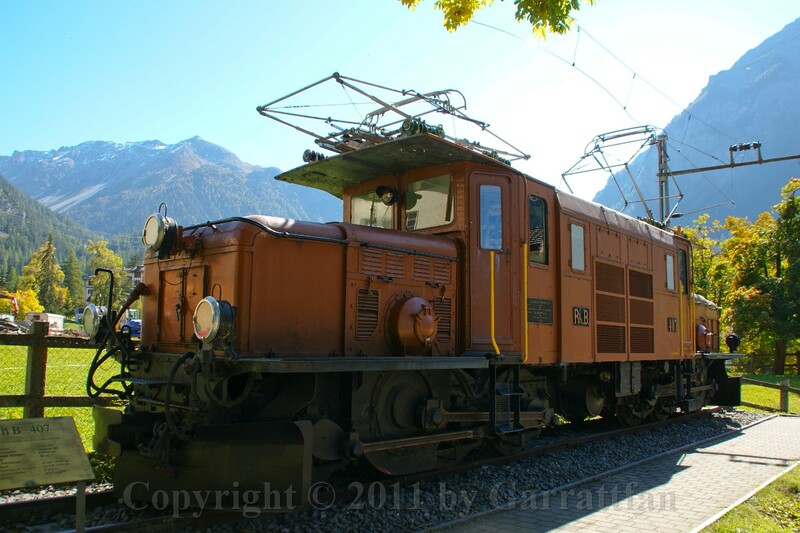 In a short holiday in Switserland in October 2011 I walked the Bahnlehrpfad of the Rhaetian Railway. 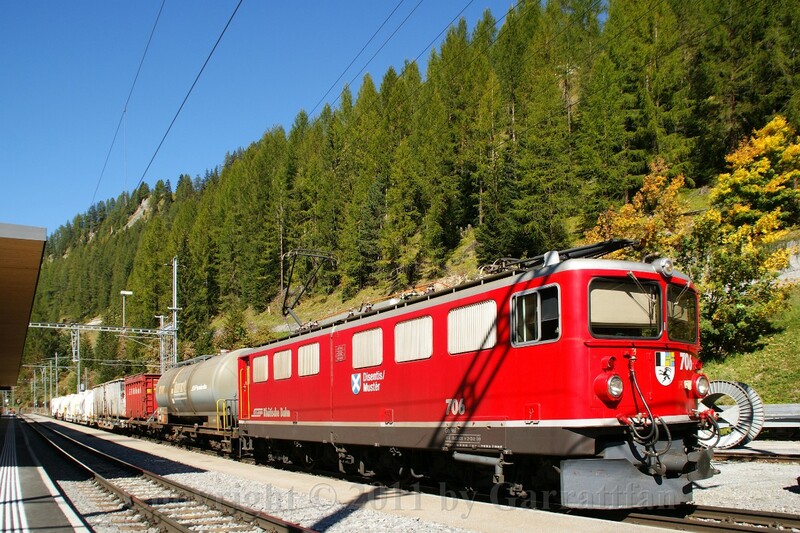 1 The Bahnlerhpfad, meaning as much as Railway learning trail, takes you descending along the Albula line of the Rhaetian system between Preda an Bergün. 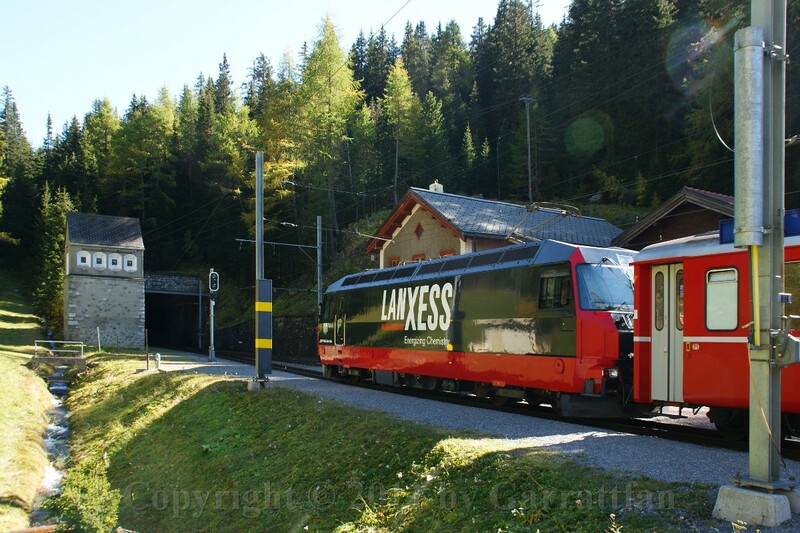 Then you can take back the train up to Preda and see the line live and first hand. I would recommend every railway enthusiast to walk the trail. It is well signed and given a normal physical condition it will not pose any particular problem. Of course the normal safety precautions for normal mountain walking apply: good sturdy shoes, sufficient water, some food and some first aid stuff. The terrain is by no means dangerous. 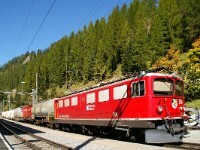 2 Start at Preda, immediately at the tunnel mouth of the Albula base tunnel. A small monument commemorates the harsh conditions under which railway lines in the mountains were constructed. 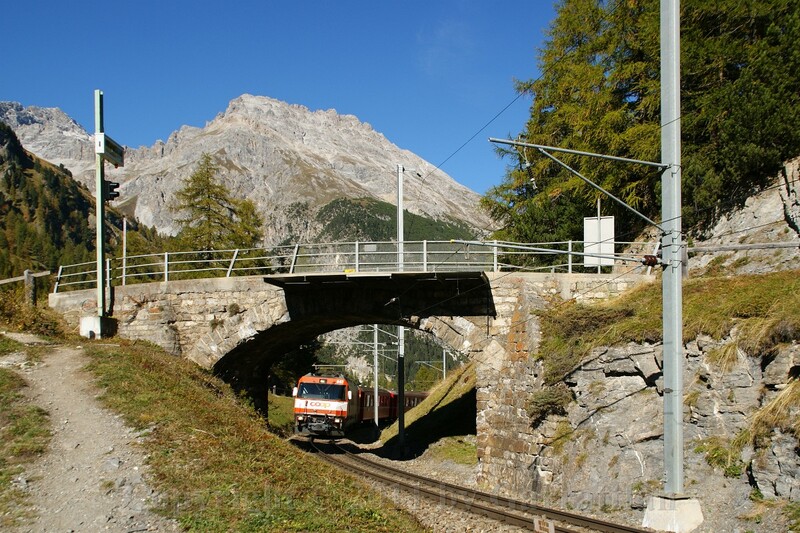 The sign says : Building the Albula tunnel. Rock that killed 3 workers. 13 others also lost their lives. Their sacrifice will not be forgotten. 3 Remains of a trial boring. 7 Between Preda and Bergün the valley floor suddenly drops steeply. Too steep to overcome with normal track laying. So the track winds its way up, gaining height by reverse loops, no less than five over the short distance. 8 This is just above the upper most two loops. Follow the train. 9 The viewpoint is at the lower right hand corner where the line just crossed the road. 10 The train swings left before turning into a tight right hand curve into the first loop. 13 With occasionally trains passing. 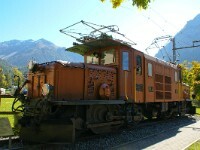 Ge 6/6/ II no 701 still going strong after more than fifty years. Read more about this class. The tree trunk at the right may serve as a reference for the next photo. 14 From just about the same spot but seriously zoomed out. The Ge 6/6 has by now cleared the half loop. 16 The learning path is adorned by sign explaining the whys and hows of its construction and any particular points of interest. 17 View down on the half loop connecting the two reverse loops. 18 A panorama. At the far right the upper loop. Running from right to left in the fore ground the exit of the first loop. 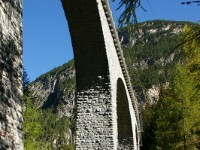 In the background the viaduct towards the second loop. 19 The path descended steeply onto the valley floor. I did not wait for a train to pass. In hindsight I regret that. 28 From almost the same viewpoint the higher end of the reverse loop can be seen. 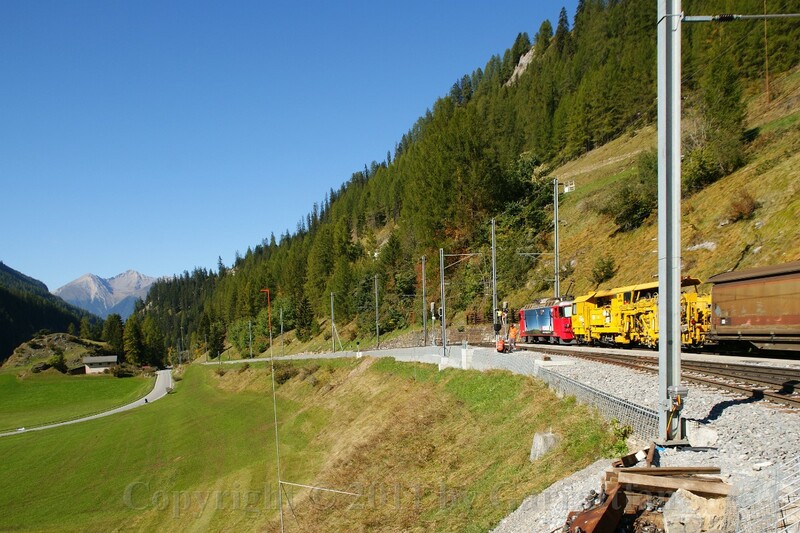 Preda is to the left, a train for Bergun will turn left into the mountain to enter te reverse loop. 29 After the third reverse loop the path stays on the left hand side of the valley. 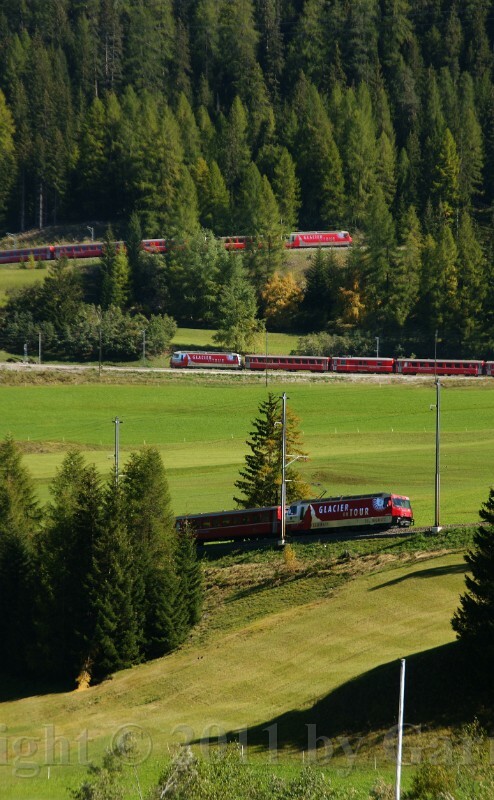 Trains though run at the right hand side. 30 Two more loops just before Bergün. Directly from the west al three tracks can bee seen simultanuously. 34 After a good ninety minutes' walk I reached Bergün. 39 The Zeughaus (tool shed) is under reconstruction, as is the whole station area of Bergün. It will house a small railway museum. 40 Another Ge 6/6 II. 46 After that, the goods train set off. 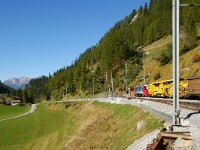 57 The train winds its way up, toward the lowest reverse loop at Bergün. It is now on the lowest of the three tracks. You can see the second stage half way up the photo. The train is travelling more or less south. 58 In that second stage between the two loops. 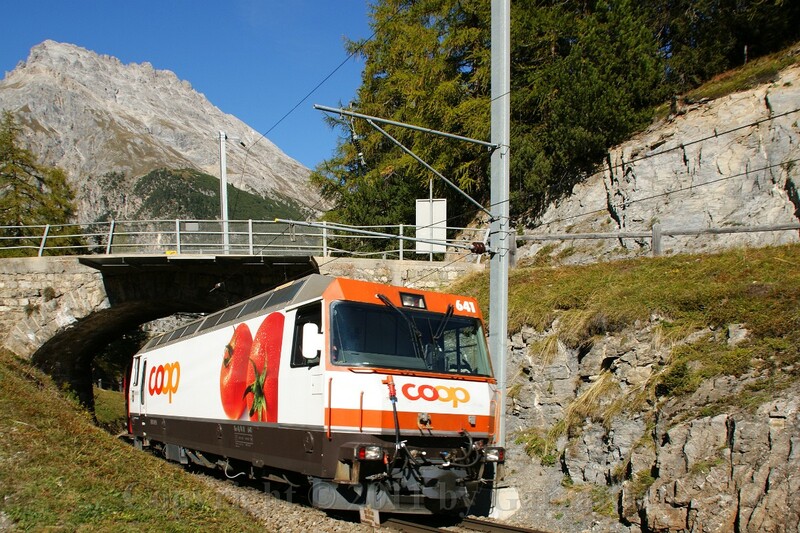 Train is travelling north. 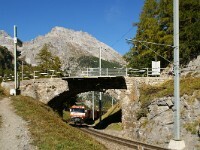 59 View on Bergün, half way in the photo the lowest stage of the line. 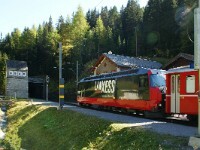 61 Bergün station. Not the sharpest photo, but for the record. 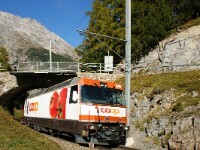 62 Entering the upper loop at Bergün. 63 And now travelling south again, second stage in the meadows, lowest stage further afield left. 67 On the top the lowest loop. The middle and upper loops cross each other eight times!! 68 The afore mentioned road bridge. The crane is at the far left. 69 After the loop. The lower part of the line crosses the river. The crane is at the right. The train has just completed a 270 degree right hand turn. 73 After the middle loop, entering the viaduct towards the connecting half loop. 74 Looking down form the viaduct on the lowest part of the middle loop. 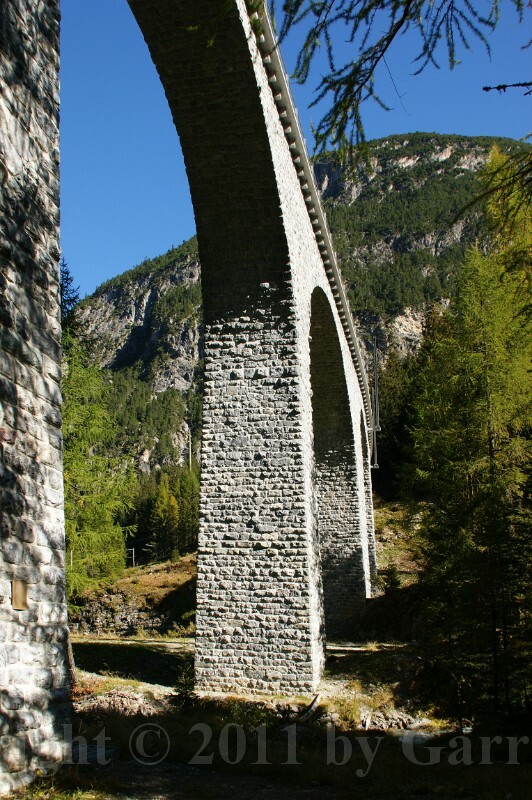 76 Sharp curves, steep gradients and stunning views that just about summarizes the Albula line. 80 An former Rheatian train driver now piloting planes?? 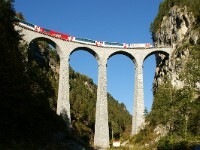 84 After having spent some lovely hours between Bergün and Preda we went home but could not resist calling at the Landwasser viaduct. This 65 m high landmark is not accesible by road but an extremely easy 20 min walk will take you there. 85 The low autumn sun gave a special glint to the scene, the cloudless steel blue air gave a stunning background. This is awesome. Stuff for picture books photographs. 88 We waited for a train, and Yess, we had our picture of the day. Or at least so we thought. 91 We waited for another twenty odd minutes for another train. But the sun was now setting fast and it would soon turn dark. I made this shot as a goodbye photo. Then.... we heard the distinct rumbling sound of an approaching train. I spurted back. 92 Oh no!!!! This can't be!! 93 Oh yes, it can!! 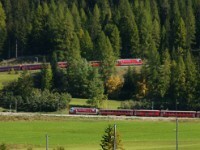 This is the Glacier express!! 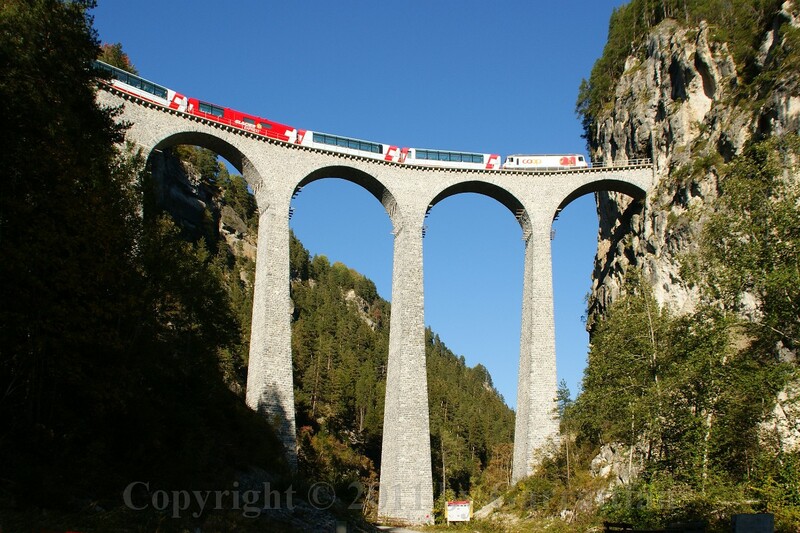 I just could not believe my luck, Switserlands most famous express train passing over it most famous viaduct in perfect weather in perfect lighting condition. 94 The train slowed down to allow passengers a good view from the viaduct. And by the way allowing me to concentrate on making good photos. 96 Japanese in "see Europe in ten days" mood.